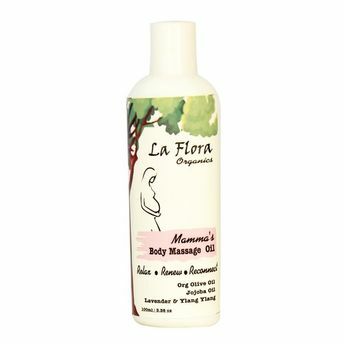 Relax & reconnect with your body as it transforms with the La Flora Organics Mamma's Body Massage Oil. Massage can be a wonderful part of your prenatal care. Take time to connect to yourself, your growing baby & to your transforming body with this massage oil. Organic Olive Oil & Jojoba Oil enriched with Vitamin E rich Wheat Germ Oil along with aromatic, relaxing & calming Organic Lavender & Ylang Ylang essential Oils. This light, easy absorption oil improves the elasticity of your skin helping it to stretch and expand.